William Jennings Bryan Oleander believes we should pay much more attention to the Liberal, Kansas Shrove Tuesday Pancake Day Rade with Olney, England. Well, folks, I stood there last Ash Wednesday, in 2015, with the newspaper in my hand, dancing in my driveway. Mrs. Peterson, next door, asked me if I was okay. Thinks because I'm an old man, there might be something creep up on me all of a sudden. "No," I told her, "everything's had its way with me already. It's just this good news shaking me up because I’ve come to expect the worst. I pounded the newspaper. Showed her the headline: LIBERAL OUTRUNS OLNEY, ENGLAND, IN PANCAKE RACE. Folks, I was beginning to wonder. You know we lost the last three years in a row. There used to be something called state pride. We'd no more let some English housewife beat us in a Pancake Race than let the Mormons outdo us on alcohol prohibition. But I tell you, that was long ago. 2015 might just show a turn in our prospects. Overall, Liberal is ahead, 37 wins to Olney’s 28, but our recent races have not been up to the high standard we should be setting for ourselves. Here's the facts: back in the late 1980s and early 1990s we were whipped seven years running. Olney was once ahead overall, 20 to 19. The good "women" of Liberal were slipping faster than lard in a hot skillet. And nobody complained that we couldn’t compete in three simple skills: running, handling a frying pan, and flipping a pancake without dropping it on a high-school running track. Last year, I ate some flapjacks and hobbled into what's left of Here, Kansas. I asked Claude Anderson at the Co-op, “What's Shrove Tuesday and what happens on it?" He looked blank as an unbuttered pancake. Barney Barnhill, down at the Demolition Derby Museum, didn't know either. Elmer Peterson, at the Here Pharmacy, swore Shrove Tuesday was a hill in Western Kansas named for a mountain man who got lost trying to climb it. Then he sold me some oat bran to put in my pancakes. Folks, I don’t think we take the Pancake Race seriously enough. Yes, we won last year. But shouldn’t we dominate? One year, the fastest time in Liberal was run by an aerobics teacher who trained by "keeping up" her aerobics. Now, imitating Jane Fonda is no way to get ready for an honest-to-god Pancake Race. Here’s what I think. If we're going to do this race, the state ought to make it a regular track and field event. Hire Betty Crocker and Aunt Jemima as consultants: we need lighter cakes, better flipping techniques. Hire track coaches and athletic trainers to make sure we are training and stay injury-free. Our contestants should be more pampered than thoroughbred racehorses, and more celebrated than the Miss Kansas Beauty Queens. After all, they’d have more than beauty, they'd have a practical skill. 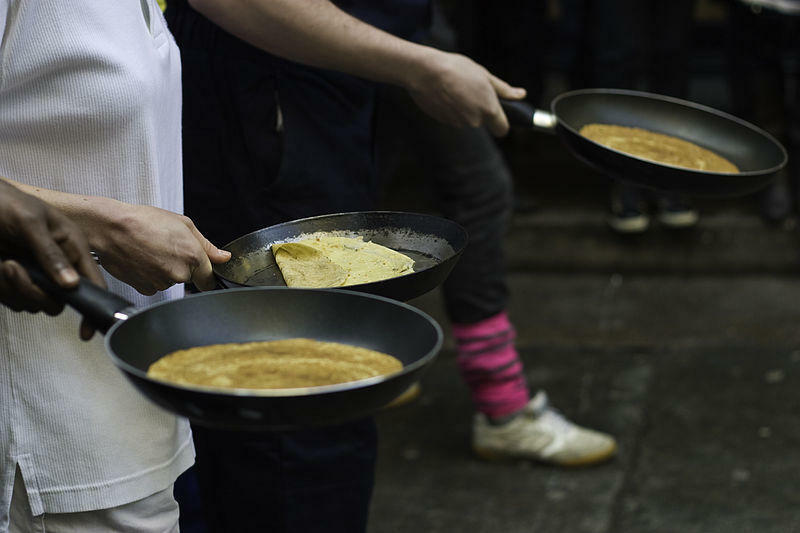 Now picture a new day in Pancake Racing. A starting line crowded with eager young ladies. Their shirts would show their sponsors: Bisquick, Pillsbury, Quaker. Their arms would almost pump those iron skillets. They would sprint around the track. They would flip their cakes. We would all watch it in slow motion while they run to victory. "Liberal!" people would shout. "Liberal! We love you!" If we can just avoid recruit and steroid scandals, we Kansans could guarantee years of state pride. If you haven't eaten today, go get you a short stack, smother it with butter and syrup, and think about the possibility of a new era. For more than 400 years, the only halt to England's annual Pancake Race was World War II. Tradition runs deep in Olney, anchored by St. Peter and St. Paul − the church with the tall spire along the bank of the River Great Ouse in the heart of England. It's here the bell has been tolling every Shrove Tuesday, calling the community to the Shriving service, the day before the 40 days of Lent. Even through the War of the Roses, legend has it the annual Pancake Race was run in Olney.